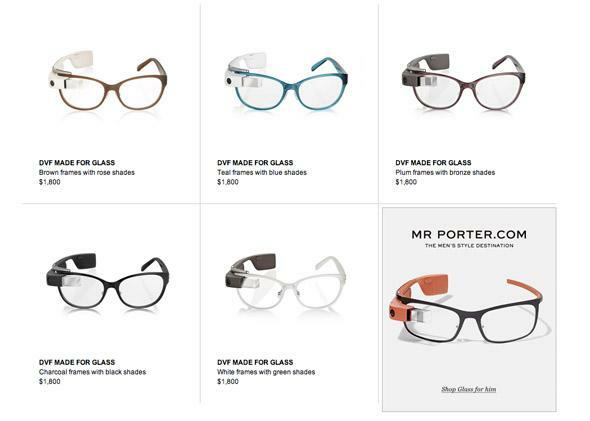 Diane von Furstenberg and Isabelle Olsson designed new frames for Google Glass. Do these frames make Glass chic? No matter how much cool stuff Glass can do or how much exposure it gets, the aesthetics are a problem. So Google has partnered with companies like Ray-Ban and Oakley in the hopes that new frames will turn things around. Now Diane von Furstenberg is the first, and most highbrow, designer to start actually selling Glass frames—but they don’t look that great. In the video below, von Furstenberg talks with the lead designer at Google Glass, Isabelle Olsson, about how von Furstenberg chose aviator and shield shapes for her sunglass add-ons. Olsson notes that the collection is something that’s “really for women.” She describes the old days of Glass as “a scuba mask with a phone attached to it”” Which … yeah, that’s pretty much exactly how everyone still feels. Isabelle Olsson and Diane von Furstenberg in DVF frames for Glass. Olsson actually looks good in her charcoal DVF frames, which channel Alex Voss, though the Glass screen is still visible. Conversely, the Glass components are well hidden in the brown frames with rose shades that von Furstenberg is wearing, but the design is intense. They’re not sunglasses you would wear to blend in. Net-A-Porter is offering a bundle where you get Glass, one pair of DVF sunglasses, and one pair of frames for $1,800. It’s cheaper than buying those components separately. A bargain! But the problems with wearing a computer on your face aren’t solved by these frames.